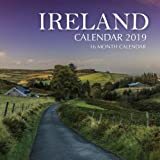 Below are some calendars with pictures of Ireland, or Irish themes. 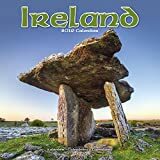 This beautiful calendar is a collection of engaging photographs and traditional blessings that capture the essence and magic of the Emerald Isle. Luminous images of dynamic landforms and dramatic light combine to reveal the enchanting heart and spirit of Ireland. Perfect for anyone with a connection to the Emerald Isle. The Emerald Isle beckons to travelers, and to the 33 million Americans who claim Irish ancestry. 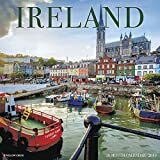 Tour a different region of this enchanted country every month—Derry, Dublin, Donegal, Kerry, and eight others—with informative text and hundreds of alluring photographs that capture Ireland’s spirit, rugged beauty, and verdant landscape. Dublin pubs are havens for great conversation, especially over creamy pints of Guinness. In Cork, there’s greenery for miles around, dotted with contentedly grazing sheep (and with majestic castle ruins, too). Wicklow’s windswept seacoasts are something out of myth—and speaking of myth, behold the Hill of Tara, where the high kings of early Ireland were crowned at the magical Stone of Destiny. December of 2019 as well as moon phases, U.S. and international holidays. Fill your upcoming 2019, with 16 months of Ireland all year round. This beautiful calendar contains 16 months and 3 mini 2018, 2019, and 2020 year calendars. Explore the beauty of the Irish countryside through the vivid images included with the Ireland Wall Calendar 2019. Each month features a full color photograph and a spacious monthly grid for keeping track of birthdays, holidays and special family events. This high quality calendar makes a wonderful wall decoration for any home or office setting. The diverse and beautiful Emerald Isle displays its special magic to you each day of the year! Stand on a craggy height to view sweeping coastlines, tour ancient ruins, visit quaint villages, cottages and classic pubs all year long. Each page allows you ample room to jot memos, notes and reminders. Ireland is renowned for its breathtaking landscapes—and its coastline boasts some of the best. 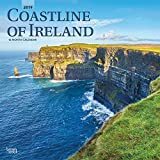 From rugged cliffs and crashing waves to quaint villages and quiet bays, this Coast of Ireland square wall calendar features stunning images of the Emerald Isle’s coastal beauty. Embark on a magical journey through the Celtic landscape with the Sacred Celtic Sites wall calendar. Celebrating timeless monuments and geographical features steeped in myth and legend, this calendar features the thin places — doorways to another realm, divine places of spiritual awakening. 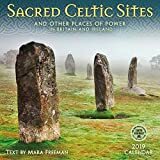 Mara Freeman, an expert on Celtic spiritual and sacred traditions, guides you through timeless monuments that are as awe-inspiring today as they must have been millennia ago. A year of ancient Celtic sites on your wall. The perfect art gift for those who love all things Celtic. Features sacred spiritual sites from England, Scotland, Ireland, and Wales. Each month offers a luminous photograph accompanied by an informative history of the site and its significance to the ancient Celts, who left their enduring signature on these incredible wonders. 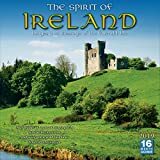 365 Things to Love About Being Irish 2019 Day-to-Day Calendar offers up a daily reason to celebrate being Irish—or to wish you were —including curses, folklore, history, quotations, slang, traditions, inventions, and Irish and Irish-American celebrities and cultural icons. This daily calendar is full of genuine Irish humor, history, and facts—not to mention limericks and leprechauns.